(1987/Connoisseur) 24 tracks - Original recordings and album is originally sealed! Marc Bolan (born Mark Feld, July 30, 1947, London; died September 16, 1977), was a leading 'Mod' and occasional male model in the early 1960s. He changed his name to Marc Bolan for his first single, "The Wizard," in 1965, before becoming a member of John's Children, a group with claims to being the first-ever 'glam rock' band. Bolan and percussionist Steve Peregrine Took, (born July 28, 1949, in London; choked to death in 1980), started gigging as an acoustic duo in 1968 under the name Tyrannosaurus Rex. They rapidly became un underground cult band. Bolan recorded three albums with Took, all a mixture of flower power philosophy and magic, and during this period Marc Bolan also published a book of poetry. T. Rex was really one of the first British underground groups, along with Pink Floyd, and held a position comparable to that held by the Incredible String Band. In 1970, Took left and was replaced by Mickey Finn (born June 3, 1947). This conga drummer made his debut on the "Beard Of Stars" album, which was a transitional collection in that Bolan introduced the electric guitar on several tracks. Then, in late 1970, Bolan and Finn had a suprise number two single with "Ride A White Swan." With the addition of bassist Steve Currie and later drummer Bill Legend, the group soon became a fast-growing teenybopper and chart attraction. Through 1972, Marc Bolan and T. Rex were at the peak of their popularity with big hits such as "Telegram Sam," "Metal Guru" and "Solid Gold Easy Action." More hit singles followed and each of them consolidated Bolan's temporary preeminence in the British world of glam and glitter rock. The film "Born To Boogie" (directed by Ringo Starr) captured Bolan at this peak stage of his career. "20th Century Boy" was a huge hit for T. Rex in Britain, but by the end of 1973, Bolan's teenage audience began deserting him for new idols. His songs and his act became even more hysterical. "New York City," "London Boys," "Laser Love" and "I Love To Boogie" were subsequent hits for T. Rex, though recorded after several members of the original group had departed. By the end of 1976, all the original members had left, replaced by session musicians. Bolan died the following year, when the car in which he was a passenger (driven by his girlfriend Gloria Jones) crashed into a tree. 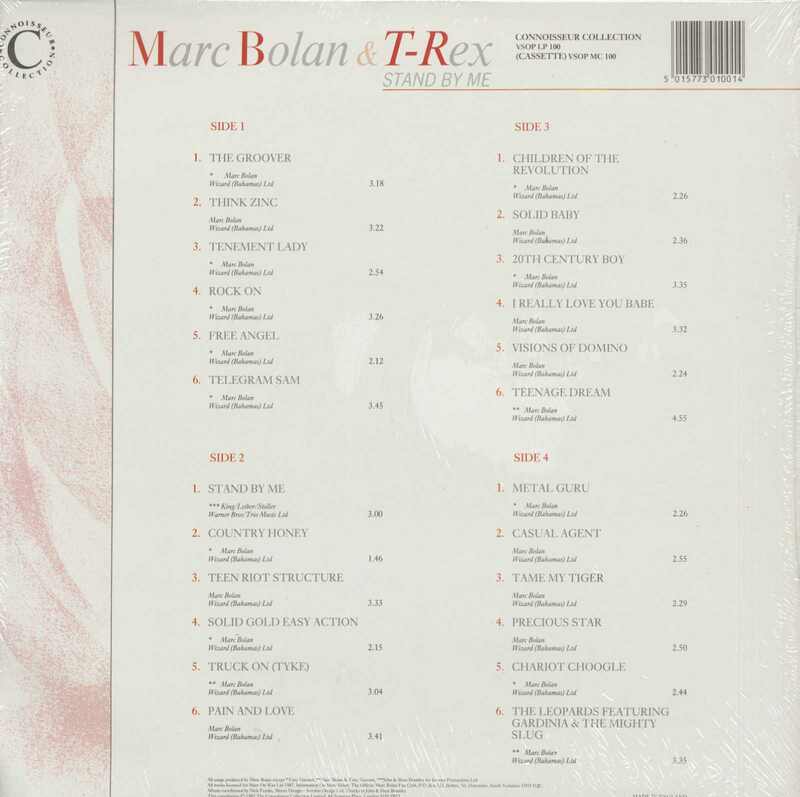 Over the years there has been considerable repackaging of Marc Bolan/T. Rex material. Bolan has maintained a cult following and his fan club remains very active. 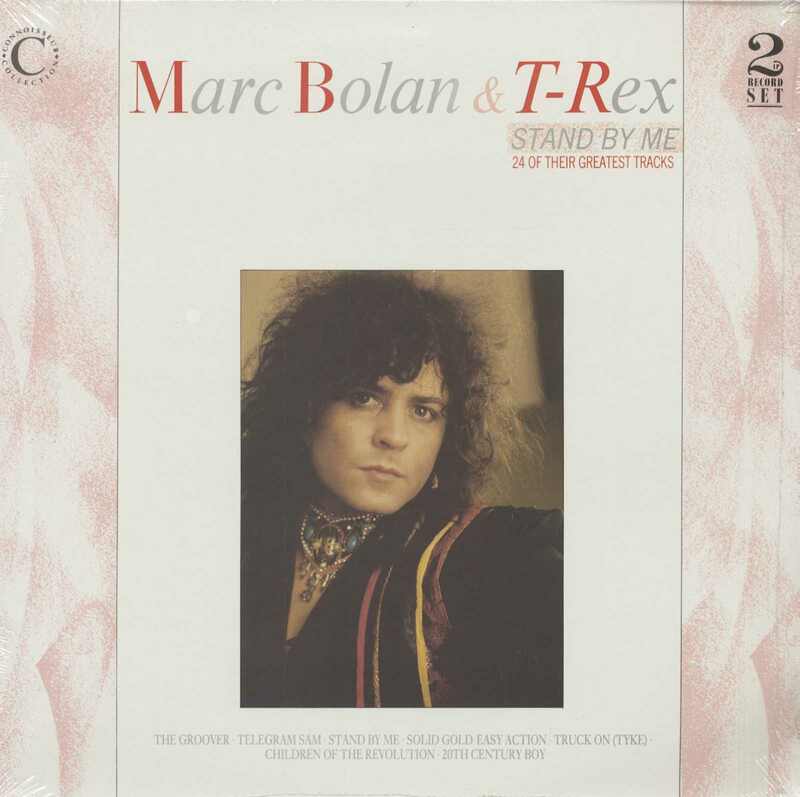 This compact disc contains eighteen songs by Bolan and T. Rex which bring back the sounds of one of the most remarkable British groups in the history of pop and of the teenage guru, Marc Bolan. Customer evaluation for "Stand By Me - 24 Of Their Greatest Tracks (2-LP)"